Provocative title, no? The observed increases over the time period 2000-2003 were 49 (53%) and 21 (22%) DDD/1000 beneficiaries/day inNova Scotia and Australia, respectively. This standard measure is set at the average maintenance dose per day of a drug when used for its major indication. It overcomes difficulties in comparing prescriptions of different price, pack size, duration and dose. Use is expressed as the number of DDDs per 1000 concession beneficiaries per day (DDD/1000 beneficiaries/day), which allows comparisons over time and place. This may be due to prescribing antidepressants for conditions other than depression in Novia Scotia. It could also be caused by an increased exposure to direct-to-consumer-advertising. Something posted about earlier on this blog: Direct To Consumer Advertising of prescription drugs, a threat to Europe? Why I am against direct to consumer marketing for medication? There are only two countries allowing “direct-to-consumer-advertising”: USA and New Zealand. Want to know how it is received in New Zealand, read this. The increase of prescription could also be due to an increase in consumer and/or prescriber awareness, education or training in depression and its management compared with Australia. Selective serotonin reuptake inhibitors (SSRIs) were the most commonly prescribed class of drugs in both areas, constituting 60% of all antidepressants prescribed. 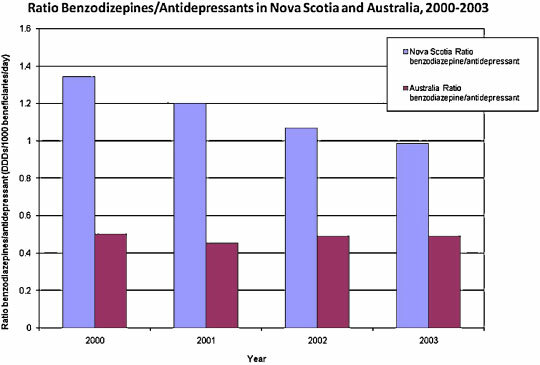 What is more troubling is that the ratio of benzodiazepines to antidepressants in Nova Scotia was more than double that of Australia over the study period. 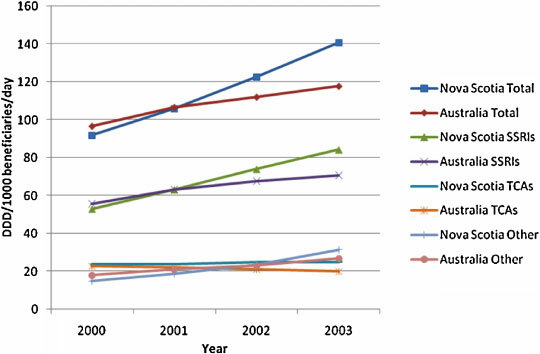 Moreover the ratio decreased in Nova Scotia but this decrease was largely due to to the increase of antidepressants at a faster rate than an absolute decrease in benzodiazepines use. Normally the number of benzodiazepines should decrease as antidepressants prescriptions increase as depression is better recognized and patients switched to antidepressants instead of benzodiazepines. Benzodiazepines have limited use, they pose a risk for the elderly. Can Pilots fly When Using Antidepressants? Previous You’re never to old to learn computer skills	Next Were is Depression Located in the Brain? Do the populations match? Isn’t this an apples-oranges comparison? I’m not sure if it makes a difference, but Nova Scotia is a very small province and the unemployment rate is very high as the province moves away from a fishing based economy (poplation is 935M vs Canada’s population of 33 Million). The maritimes provinces (Newfoundland, Nova Scotia, Prince Edward Island and New Brunswick) have traditionally based their economies on fishing and it is increasingly hard for people to find work and take care of their families…which may explain a higher rate of depression. this article is extremely interesting. What really sparked my attention was that ONLY the United States and Australia allow direct-to-consumer advertisement. I would want to know why is this? What do other countries think about direct-to-consumer advertisement that is making them not allow these types of commercials to air. There has to be a correlation between the UnitedStates/Australia depression percent to other countries…….